Belgian artist PANAMARENKO is probably the world's leading authority in crafting bizarre flying machines that are meant to be airborne but never actually made it into the air. His vehicles are among the most poetical sculptures in existence, capturing man's dream to fly in an unprecedented way. 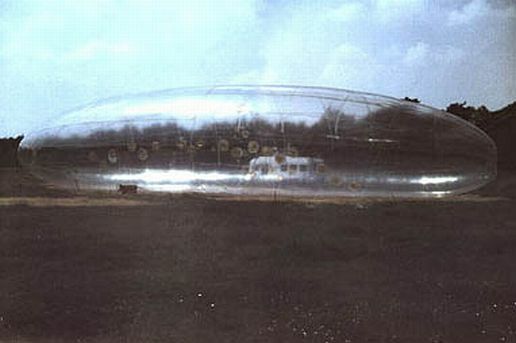 Pictured here during a test-flight in 1971 in Balen, Belgium, is "The Aeromodeller", an inflatable Zeppelin-like transparent balloon. The nearly 30 m long contraption was filled with hydrogen, after which it took a vertical position and had to be ripped open with a pair of scissors to prevent it from single-handedly disappearing into the sky. Although it never flew as initially intended, "The Aeromodeller" did find its way to prestigious European museums such as the Centre Georges Pompidou in Paris and the Crystal Palace in Madrid, where it was destroyed because of too high temperatures. A restored version is now on exhibit at the Royal Museum of Fine Arts in Brussels.